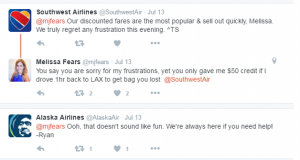 » Is Social Media the New Customer Service Platform? Is Social Media the New Customer Service Platform? The power of social media is growing at a rapid rate and the smallest of interactions online can have a serious impact on brands and businesses. Is your company prepared to handle social media inquiries within the hour? A few are. Most are not, which can potentially create a gap between customers’ anticipated response time, and your actual ability to provide a response. Working with an agency like Anvil Media can help eliminate these problems, and agencies can help guide a consistent and appropriate brand strategy when dealing with customer service requests, complaints and yes, even compliments. A 2013 study by Simply Measured showed that 30% of brands have a dedicated customer service handle on Twitter, with the average response to a complaint being 5.1 hours. Only 10% of companies answered within the hour. And the numbers haven’t gotten any better since then. In 2015, a study by Brandwatch showed that most retail brands still don’t listen to customers on Twitter. They discovered that 46.6% of brands engaged with any tagged @mentions (which were categorized as neutral, questions or complaints). 64.6% responded to questions within 5 days and only 11.2% responded within one hour. They also found that brands actually take LONGER to respond to questions than general comments! Research found that among those respondents who have ever attempted to contact a brand, product, or company through social media for customer support, 57% expect the same response time at night and on weekends as during normal business hours. Social media is 24/7, and while your employees shouldn’t be expected to work those hours as well, there needs to be a system in place. Experiencing negative or no response at all from a brand on social media can lead to detrimental results for a company. 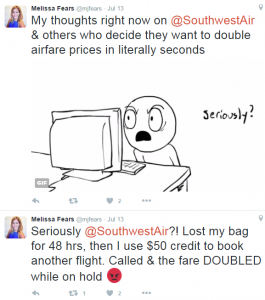 While I’m not likely to impact millions, my recent bad experiences on social media with Southwest, has led me to no longer be a customer of theirs. While my tweet took over two hours to be responded to (and didn’t even respond directly to my complaint) Alaska Airlines responded with an offer to help. With a tagline of “Our Social Care team is here for you 24/7.” I like them already! Yes, tweets aren’t always the route most companies want you to take, the world of mobile is upon us, and let’s face it, who wants to spend 10 minutes+ on hold on the phone rather than send a 10 –second tweet. Unlike other airlines who are infamous for their poor customer service (RyanAir and Southwest, I’m looking at you) JetBlue has taken notes, done their homework, and they’re ready at the helms. There re brands that even have dedicated customer service social channels, like Apple Support. For more examples of the good, the bad and the ugly. How does your brand handle social media customer service? If you need help, let us know! Humanize Your Brand – Attach names to your responses, including the person you’re interacting with and your name. Putting a name to a business adds depth and makes the user feel like they’re speaking with a person instead of a chatbot. Respond in a timely and comprehensive manner – Customer service and timely responses go hand-in-hand, but for social media there is another set of rules completely. Although social never sleeps, your employees do. In order to meet your customer’s needs and requests, establish response time expectations, such as when support agents are available. Respond to questions within 24 hours no matter what. Take it offline whenever possible. Go the extra mile for your customers. Think about what type of experience you would like to have. Research shows that customers are willing to even pay more for a good customer service experience. Keep in Mind Work of Mouth – Customers reviewing your company because of good customer service help marketing to do their job.